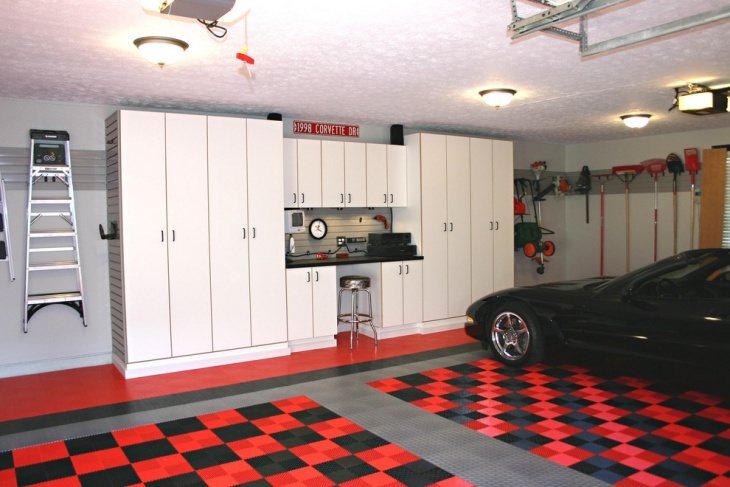 It is important to take time and be cautious when choosing flooring tiles for your garage. Regular tiles may be cheap and pretty (as they come in different shapes, sizes and designs), but they may not last long. 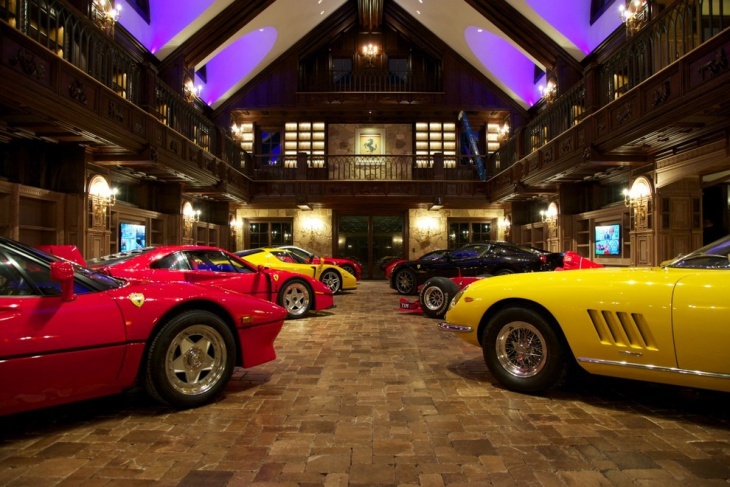 Your garage is the home of your vehicles. This is the place where you would probably do some mechanical tasks. These are messy tasks, thus you need easy to clean garage flooring tiles that can also withstand the test of time. This garage has a good example of a nicely designed flooring. The colors of the tiles and the way they are arranged are truly captivating. What’s really good about them though is that they are Free-Flow tiles – they are like a grid that allows dirt and water to go directly into the floor. So there is not much mess to worry about. Interlocking floor tiles are increasingly gaining popularity. 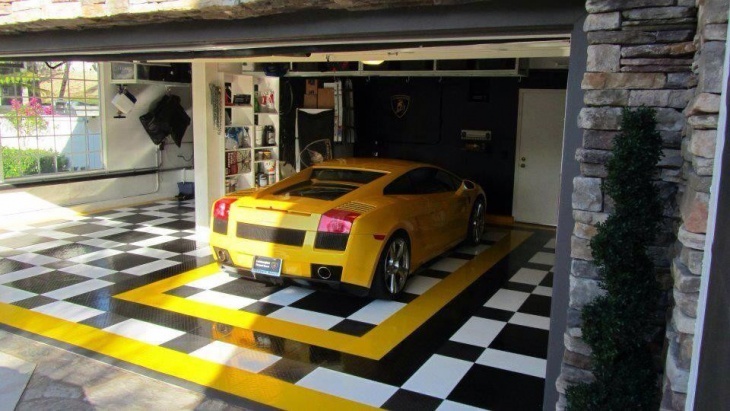 If you like the rubbery feel of a garage interlocking tile flooring you can go for a single color design, or you can take a hint from this garage and go for two-tone design. Concrete flooring is flexible flooring. 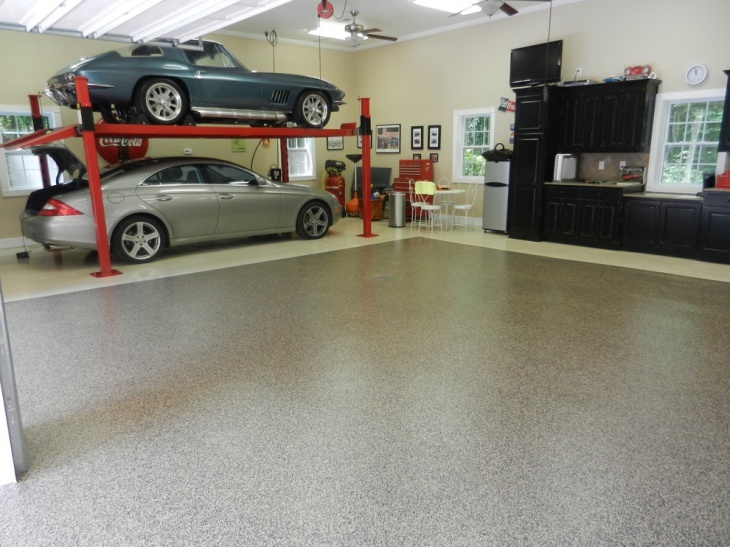 For the shiny and clinically-clean look – like on this garage – you should go for the metallic epoxy floor painting system. Remember that choosing the right color is important. 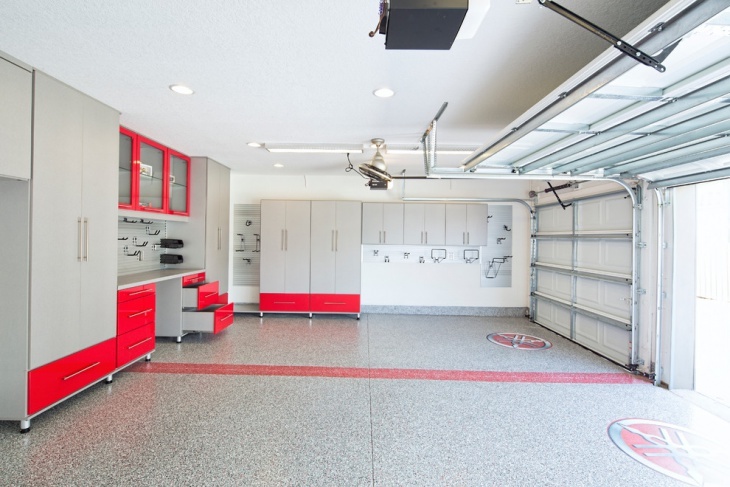 This garage has the dolphin gray color, which perfectly fits the silvery look of the whole set up. 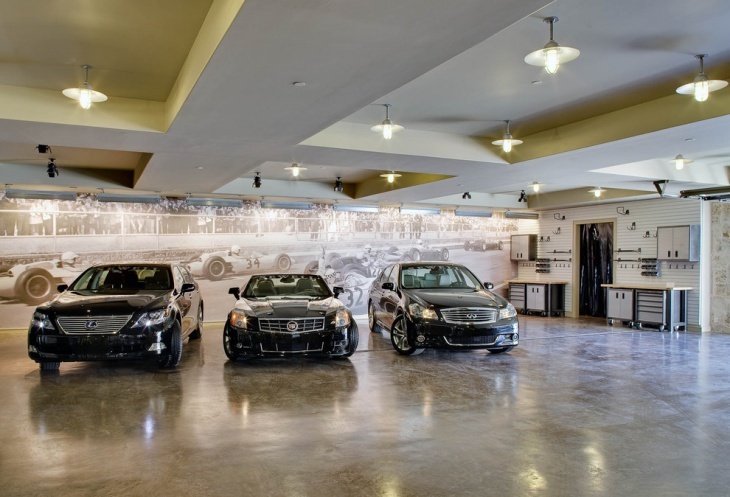 Epoxy flooring is a common choice for garage flooring ideas. It is easy to apply and nice to look at when finished. This garage has epoxy coated flooring the creeps up into the room foundation. 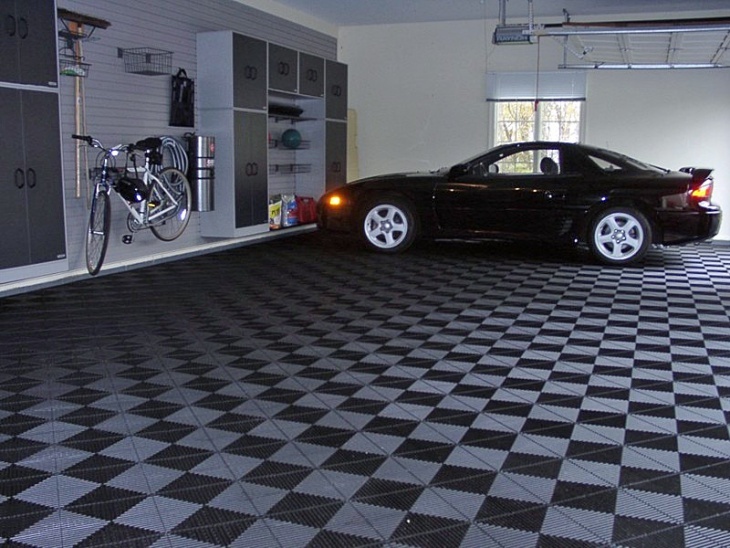 PVC interlocking tiles are nice to use because they come in different colors, making it possible of DIY’ers to created nicely designed garage floorings. 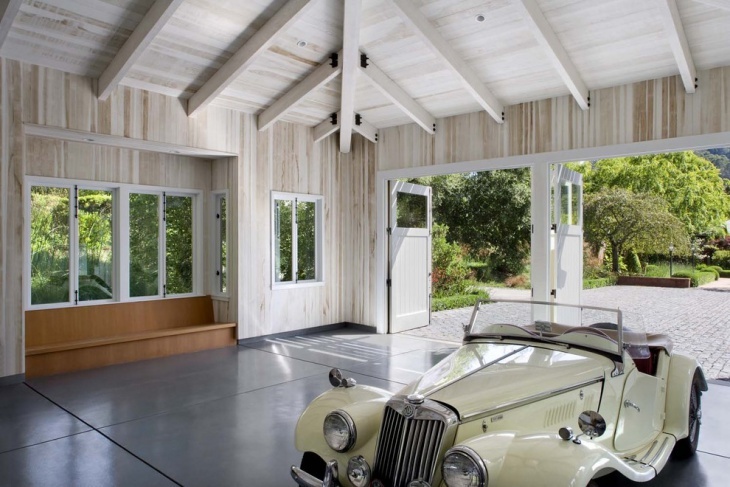 This garage, for instance, has a nicely designed flooring wherein individual spaces for each car are designed differently than the rest of the room. 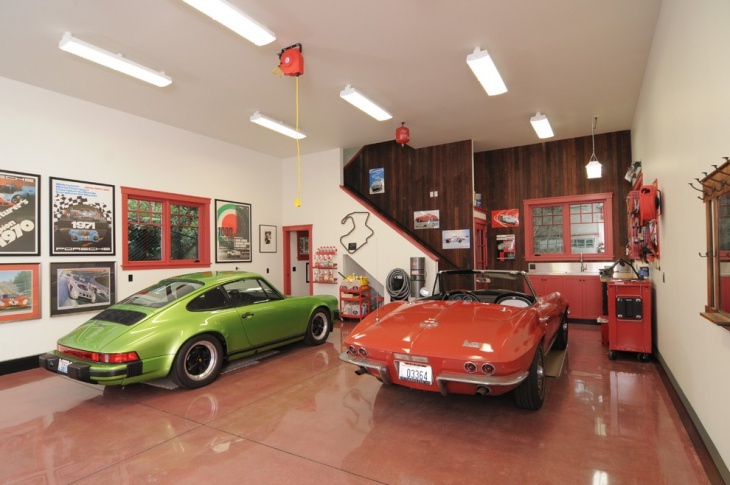 These polished concrete garage floor tiles are so nicely attached that they really look so appealing. 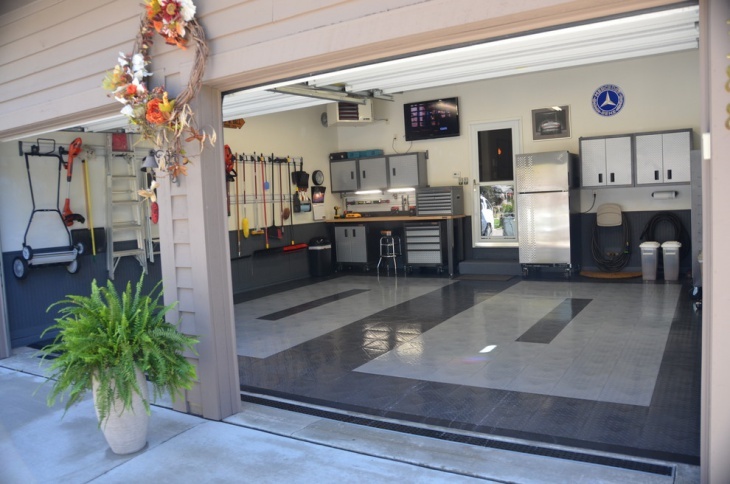 Used for this garage are scored concrete slabs done with heavy-duty epoxy sealer. This allows for easy clean up of oil spills and zero slab penetration. 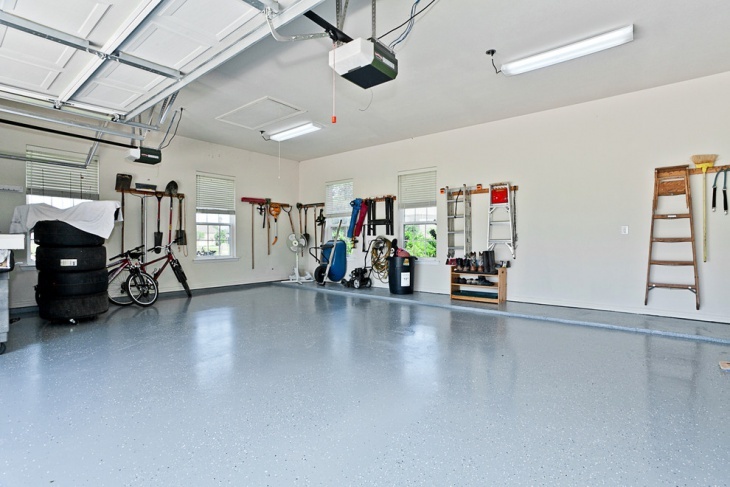 Your cement or concrete garage floor can be made to look more appealing by using a high-quality epoxy sealing system. 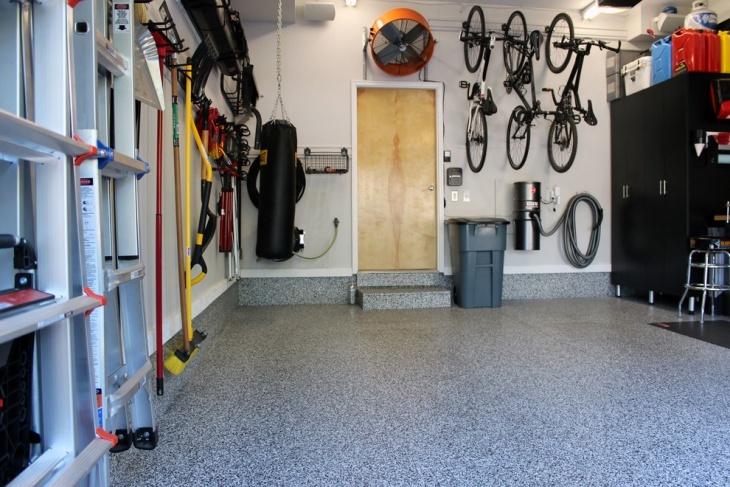 The polished look of this garage floor makes the whole space an easy to clean garage. 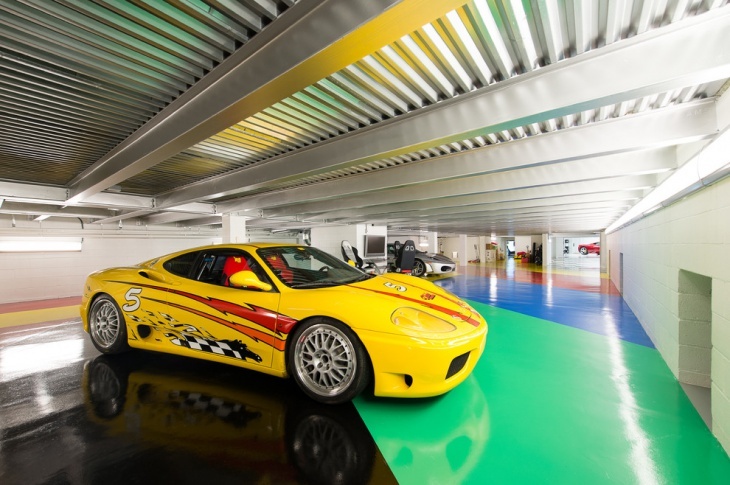 This colorful garage flooring system is done in vinyl and it provides the space with a slip-proof flooring. It is the best option for small spaced garages. 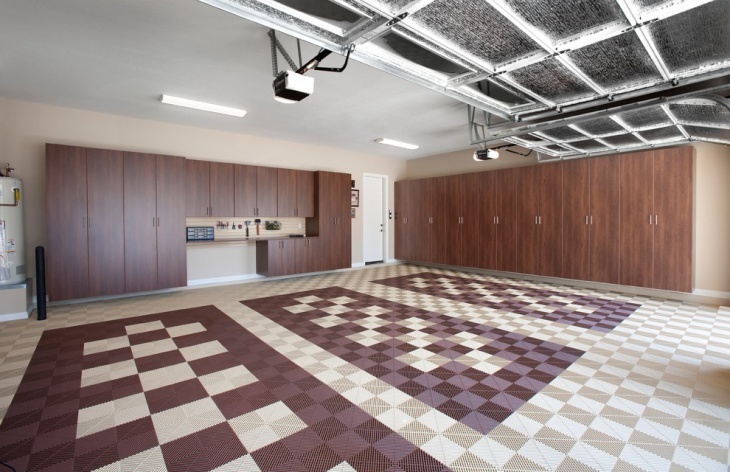 Modular garage flooring system is easy to install and definitely just as easy to maintain. These are the main reasons why they are becoming more popular. They are also durable making them ideal for space that experiences heavy daily foot and vehicle traffic. 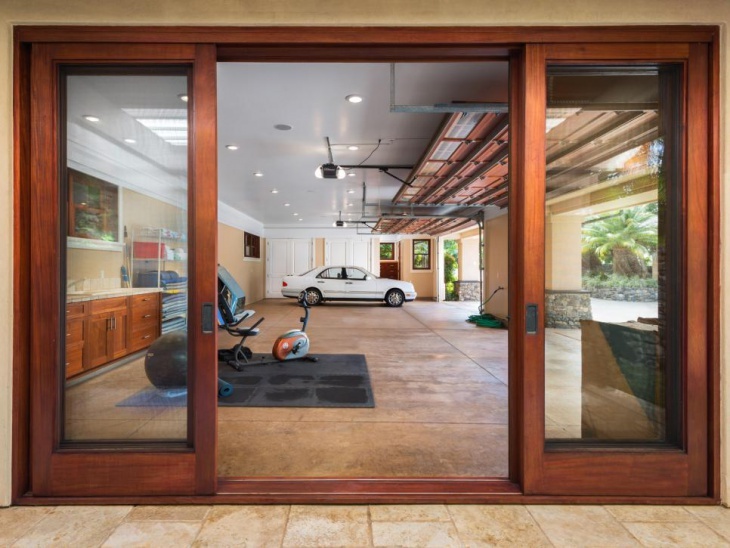 If you want long lasting garage floors it is essential to know what’s best to use and what to avoid. The first thing you should know is that DIY floor paint coating does not always work. So, it is best to consult the professionals. 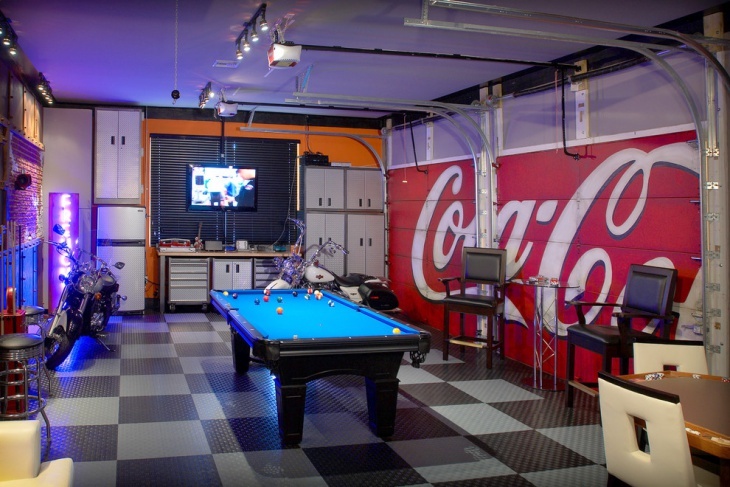 Another thing to keep in mind is that there are several choices when it comes to garage floor tiles. This means that you must first determine which type is going to make you garage space look better and serve you better. 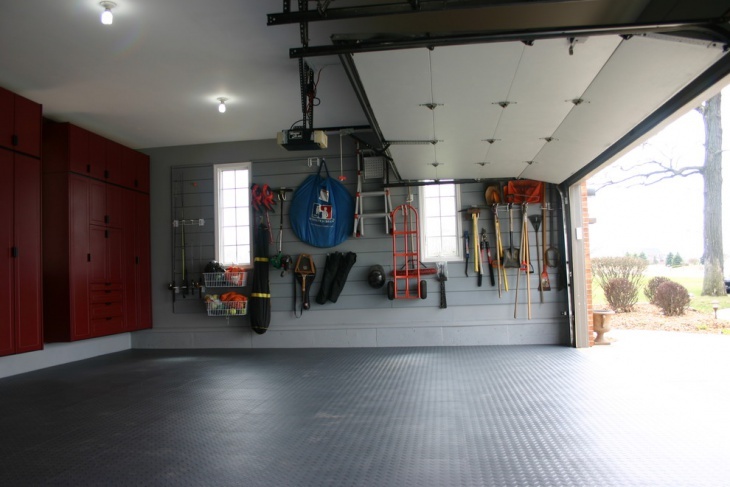 Basically, there are several options for garage floor tiles. Your choice should be based on your personal preferences, as well as opinions of your family and some experts. 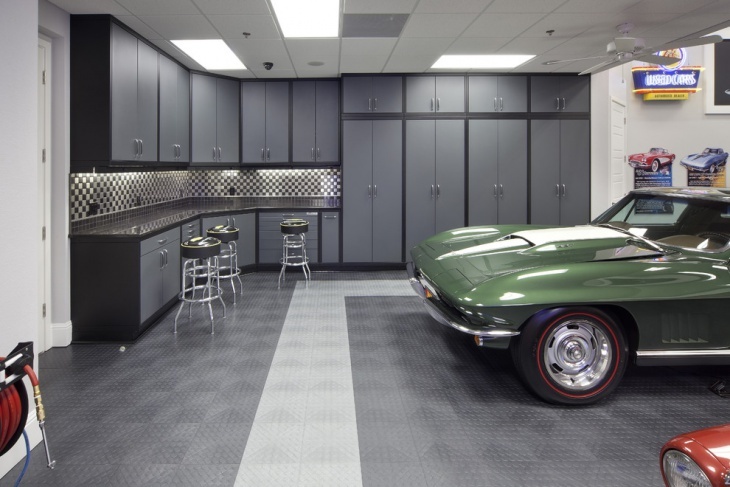 The garage flooring design samples featured here should give you some nice ideas on how to start on your own garage flooring project.